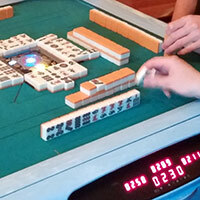 The Pacific Mahjong League (PML) is a Japanese Riichi mahjong league. We use modern riichi rules and have a published rulebook. We host events every weekend in one or more US locations, and make appearances at conventions and tournaments around the world. Whether you are a seasoned player that wants play competitively, or a curious beginner that wants to learn how to play, we invite you to join the Pacific Mahjong League!